Because, of course, the contests themselves are never enough. There must be narrative beyond ball-in-hoop. The monster must eat. In hearing Miller’s calculated comments, it was clear that he wasn’t walking into the monster’s trap but rather whistling the beast close, patting him on the head and spoon feeding him a tasty morsel and a “gooooboy.” The monster rolled over for a belly rub. 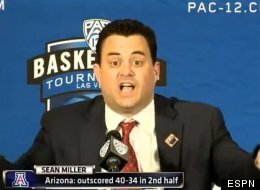 Think about it, Miller was coming off an opening night game in which his 12th ranked Wildcats could only be streamed online. I watched from a phone. Then it was a 5pm PST Pac-12-Networks-limiting contest against Bradley. Meanwhile, Miller’s contemporaries were at the Champion’s Classic playing a made-for-TV event as the centerpieces of college basketball. There was Coach K, Cal, Izzo, and Bill glad-handing at the United Center while Sean was…lost in Larry Scott’s brainchild? Maryland and Georgetown played a game that was attended and live commentated by Michael Wilbon and Scott Von Pelt, two of ESPN’s highest paid talents. Are the Pac-12 Networks a failure? That’s a whole different topic. Shade was thrown! UCLA was dissed! And the Bruins are getting recruits. They have the 4th rated 2016 class. Inconsequently, they’re not getting audiences. You know who else doesn’t draw? LSU (50th nationally), Cal (54th), and Washington (78th). Those three schools had the 5th, 3rd, and 6th rated classes in 2015, respectively. The beast’s perfect treat: Miller’s statement is both factual and flawed. Because the correlation between attendance and recruiting is limited. The correlation between air time and attention, however, is high. Recruiting is attention. Attendance is attention. The common thread, naturally, is attention. And what is the measurement of attention? Is it recruits? Fan attendance? Clicks, page views, impressions, subscriptions, form completions, mentions, likes, or purchases? In an age of hyper localized and personalized media, how we appeal to an audience can be very specific. The key to success in these endeavors is a complete and thorough understanding of audience. Sean Miller made his presence known on the broadest scale and his 2016 recruiting class includes a kid from Finland. Steve Alford’s class includes all Californians. Maybe, just maybe, Miller has learned he’s got a team better than even he thought? Feed the monster, Mr. Miller. I’m not knocking Arizona. Buy maybe if you schedule someone other than Bradley for your opening day game you would get more attention. I hear ya and everyone has these “cupcakes” on the schedule. Conversely – and this isn’t an AZ vs. UCLA thing – but look at who’s on UCLA’s schedule: UNC, Kentucky, Gonzaga and an assortment of other high ranking opponents that could bubble up in the pre-season tournaments. How’d that UCLA-Kentucky game work out last year? Scheduling is it’s own fascinating beast. This season has long projected to be not as good as the previous two, the scheduling strategy was likely to stay low key. I make my final point (Arizona might be better than even Miller thought) as rationale for this lesser schedule. All of that said, hoping Arizona and Michigan State square off in the finals of the Wooden Classic. Thanks for reading and commenting, Chip!